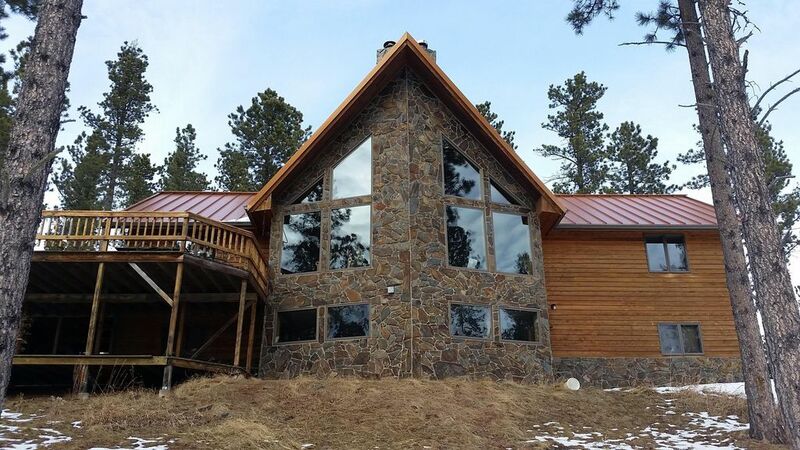 6BR/3BA Family Gathering/Reunion or Sturgis Rally (Rally week is $5,900). The 'Extravaganza!' cabin is located in the Black Hills of South Dakota just 15 minutes from historic Deadwood and 45 minutes from Rapid City. Tucked away in the ponderosa pines, you'll enjoy seclusion and relentless outdoor excitement as this property sits on 16 acres and borders National Forrest Service land. Inside our newly remodeled home, you will have a peaceful panoramic view through the 15 foot, A-frame style windows of Custer Peak and the Black Hills from the great room. At night, our large slate fireplace offers romantic evenings. Pets are NOT allowed, No Smoking. On the main floor, there are three fully furnished bedrooms (1 king, 2 queens) with two full baths, a fully-equipped kitchen for all your cooking requirements, and a large Great room with an open floor plan lending an excellent party atmosphere. Downstairs, three more bedrooms (2 king, 1 room with a twin & queen bunk beds), a full bath round out the sleeping arrangements. Another complete kitchen with a bar opens into a large Entertainment room complete with top of the line Brunswick pool table, foosball table, dart board and game table. Outdoors, an extravagant cedar deck is available for summer outdoor lunches and parties, while overlooking the 16 acres on which the Extravaganza cabin is located. A lower deck for privacy with a 6 person hot tub is another great amenity. Also a large covered patio has been added to the back of the cabin so that you are still able to enjoy the outdoors even if it is raining/snowing out! Adjacent to the cabin, are the vast stretches of the Black Hills National Forest. Favorite activities of our visitors include: Mountain Biking, Hiking, Frisbee Golf, and Bird Watching in the summer along with cross country skiing and snowmobiling in the winter. Only minutes away is Tomahawk Golf Course, Lead Country Club, and Terry Peak Ski area. Deadwood also offers old fashion high-stake casino gambling, fine dining, and is rich in western mining and outlaw history. Be sure to bring your swimming trunks too! In addition to our hot tub, Roubaix Lake is only 10 minutes away, and offers a small, quiet beach where you can swim and canoe. Pactola Lake, 30 minutes away, is a large mountain lake with ample room for water-skiing and great fishing. There are also numerous creeks in the area, where trout abound. The Steel Wheel, within a couple miles of the cabin, is a gas station/general store that has all your essentials. Next to the Steel Wheel is Claim Jumpers that serves great food. About 1 mile away is Boondocks, a 50s style gas station that is a unique place to stop in and see. You'll love this cabin, the area, and the locals! I am the son of one of 3 owners of the property and live in Rapid City, SD. My parents are from Wagner, SD and we have 2 other owners from Casper, WY & Minneapolis, MN. The 3 guys all went to the School of Mines & Technology in Rapid City and that is where they met. In the early '90s they bought the land and built this cabin all by themselves! I have grown up coming out to visit the cabin my whole life and now live and work in Rapid City. Since I am the closest to the cabin I take care of renting the place out! This place was built to be able to enjoy with family and friends and to have a fun vacation place to meet up! We enjoy the total peace and quiet. We have no phone, fax, or computer at the cabin. There is a TV that pick up a couple local channels as well as a DVD player to watch movies but we personally do not use it much as there is plenty to do outdoors in the beautiful Black Hills! !